So mornings there in the mountains makes for some great views. Though I was unable to get the picture I wanted this is still pretty. When I am go down the road in my home town, I come to a clearning the looks out over the river in front of the mountains. 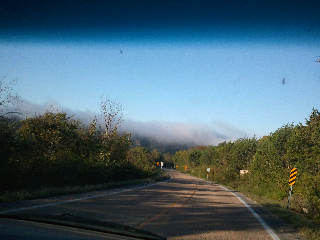 One mountain is pretty high so the fog covers all but the tip sticks out. It is a breath taking view to see and absourb all that mother nature has given us. These mountains are what makes this home for me, no other place can compare.